Jimmy Griffith, a ShelterBox Response Team member from New Zealand, talks through a translator to Guljar and her family about the Rohingya exodus from Myanmar. It has been an arduous journey, carrying a baby, and just boiled rice for food. They have fled violence, but are far from secure. Guljar is forty years old. A widow for five years, she is bringing up her two daughters aged 15 and 12, and her son aged 9, alone. Her 15 year old daughter has a baby, just 18 months old. In Myanmar they had a home and a small farm with a few animals. Life was good for them. Until they became increasingly concerned for their own safety, and felt they should leave. Guljar is talking to ShelterBox’s Jimmy Griffith, in the overcramped mud bowl that is now her family’s sanctuary in Bangladesh. She and her family are among half a million Rohingya who have fled in fear across the border to Bangladesh. ShelterBox, experts in emergency shelter and international disaster relief, are working with what has been described as a ‘monumental’ influx of desperate and exhausted people. It took them three days of trudging, carrying a small child, for this family of five to scale the mountain. This is open wild country, and there were no tracks to follow. After spending days and nights out in the open they arrived at one of the Bangladesh camps that have sprung up in the Cox’s Bazar region. Guljar, her girls, son and granddaughter were given a small 3m by 5m plot of land by the Bangladesh government. They were also given flimsy black plastic sheeting, bamboo poles and rope so they could make a shelter. We are so grateful for everything we are given. Unfortunately there are no trees around which makes it very hot under the black plastic (it can be 33-36 degrees in the sun). Also when it rains they leak. Most of these plots are on terraces above rice paddy fields. When it rains the ground turns to ankle-deep mud, so families stay inside their shelters, cramped and very hot. Everyone is worried because the cyclone season is coming soon, which threatens both the flimsy shelters and the terraces they are pitched on. ShelterBox is working with a cluster of other non-governmental organizations on a coordinated aid program, but the numbers needing help are challenging, and at times overwhelming. We have an experienced team in Cox’s Bazar working hard with local Rotary contacts and partners to help as many vulnerable families as possible. These families left their homes with nothing and we know that they desperately need shelter, lighting, and water. Tarpaulins and ropes will help shelter families from the heavy rain and harsh sun, blankets will bring comfort and warmth at night, solar lights will help families feel a little safer in the dark, and water carriers will help keep water clean. ShelterBox has just signed its first agreement to import sufficient of these to support 4,000 Rohingya households. Our tarpaulins and fixings are heavy-duty, and have been used in the worst weather conditions in all climates. But our resources and manpower are stretched, with ShelterBox responses continuing elsewhere in Bangladesh after vast floods, in the Caribbean after the hurricanes, and in Africa, Syria and Iraq with continuing conflict. So I’m grateful to all our generous supporters worldwide. 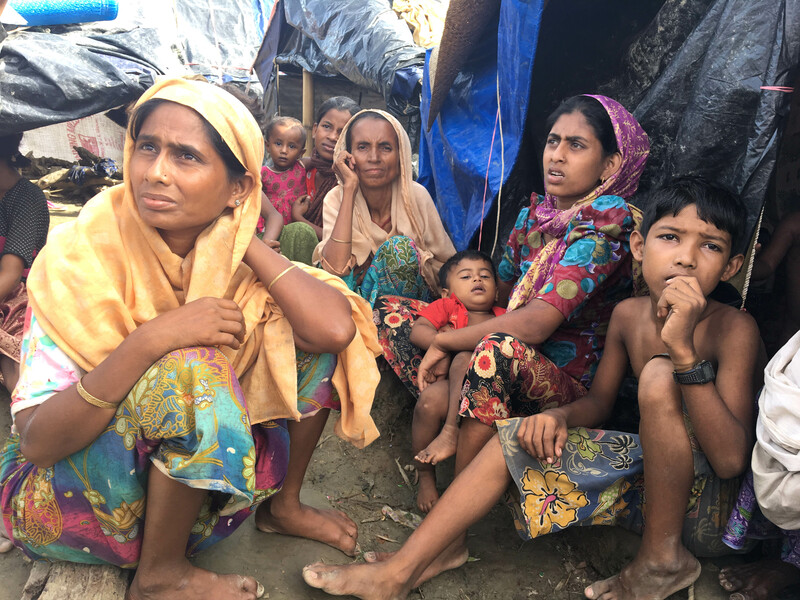 · See ShelterBox Response Team member Liz Odell reporting from Cox’s Bazar, Bangladesh, with views of the Rohingya camps here. · The photos above are free to use in the context of this press release. Please credit ©ShelterBox. · We have a team of experts available for interview, and we can also connect you with our teams in Bangladesh responding to both the flooding and the Rohingya crisis, communications and workload allowing.